Essay by Robert Storr. Introduction by Kirk Varnedoe. 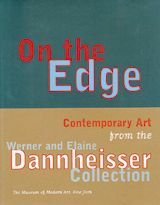 The Werner and Elain Dannheisser Collection is a group of artworks--paintings, sculptures, texts, billboards, drawings, videos, neons, photomontages, installations, and photographs--that together provide a running account of the simultaneous attractions and provocations of contemporary art. Produced by 33 artists from Europe and America--among them Carl Andre, Richard Artschwager, Matthew Barney, Joseph Beuys, Sue Coe, Katharina Fritsch, Gilbert & George, Robert Gober, On Kawara, Jeff Koons, Richard Long, Bruce Nauman, Sigmar Polke, Richard Prince, Cindy Sherman, and Christopher Wool--and dating from the 1960s to the 90s, these works document artistic directions that are still in the process of making themselves known. 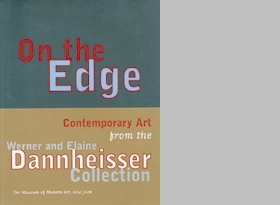 The collection, the largest gift of contemporary art ever given to The Museum of Modern Art, charts an independent path through the maze of new ideas and styles that characterized the last three decades of the 20th century.